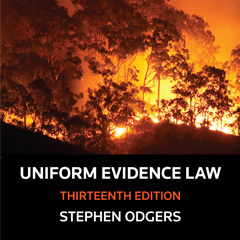 Uniform Evidence Law, 13th Edition provides Australia’s leading guidance for barristers, courts, litigators & students alike. With its popular and highly accessible annotated legislation format, and comprehensive commentary on the ALRC foundations of the law, this is the authoritative resource on evidence law in NSW, the Cth, VIC, TAS, the ACT & NT. 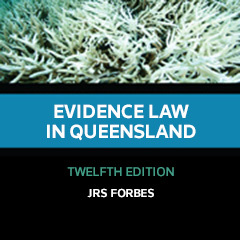 This new work provides practitioners and students alike with reliable, up-to-date and comprehensive commentary on the Evidence Act 1977 (Qld). John Forbes has applied his expertise in eleven previous editions and once again delivers an authoritative resource for practitioners, law enforcement professionals and students. From the start of any engagement you and your client need good advice on what are the expert issues of the case and how to resolve them. Expert Evidence: 75 Expert Areas is comprehensively drafted to fully prepare the everyday litigator for their legal matter, helping to ensure that ultimately your client is getting the best advice possible. From the start of any engagement you and your client need expert advice on key evidence issues of the matter and how to resolve them. Hugh Selby, Co-Editor of Expert Evidence: 75 Expert Areas unpacks what is expert evidence, and his one ‘must do’ piece of advice for lawyers working with experts. 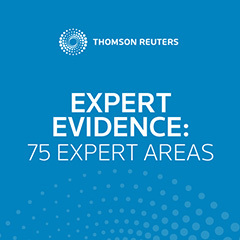 Expert Evidence: 75 Expert Areas is edited by Ian Freckelton, QC and Hugh Selby and available now on Thomson Reuters ProView.